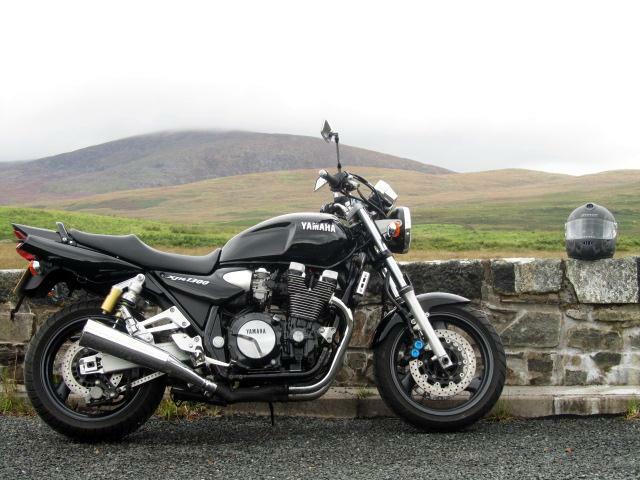 One of my favourite bikes – when I could avoid motorways – especially in wind and rain. But I’ve had five of ’em so they can’t be all bad. She was completely bog standard in that first pic before I got the notion to fit an Akroprovik exhaust. That was just the start – before long she had all sorts thrown at her as she travelled around the UK and across Europe to Spain and the Balcans. That’s enough of cherry picking — this was always going to be a re-hash so let’s see if I can string a few Posts together. Just to be contrary I will start with the last XJR I owned – a very low mileage black un. It looked a treat after a dose pf my brand of TLC but – like any bike that hasn’t been used for over ten years our modern fuels turn to gel and choke the jets in the carbs. Nuff to say – I was very familiar with her carbs by the time I was finished with her. After yet more work to clear the carbs of my XJR I grabbed the excuse to take her for a test ride when I was done. First stop was Skyreburn tearoom on the A75 for a cuppa then along to Creetown – famous for it’s Country & Western extravaganza every summer. The road itself has been resurfaced using the cheap tar & chip method and has a generous covering of loose chippings. They aren’t a problem for my Tenere with it’s semi-knobblies but the XJR has normal road tyres so it pays to take care. From the junction by the defunct railway siding an unfenced road runs down to the usefull visitor centre by the farm. The centre is un-manned but it has video info – leaflets and again – clean toilets. After the farm a dirt road goes by Cairnsmoor of Fleet viaduct all the way through to Clatteringshaws Loch but it’s really only for hikers and cyclists after the viaduct. I lost many of my early posts when my former laptop went down. 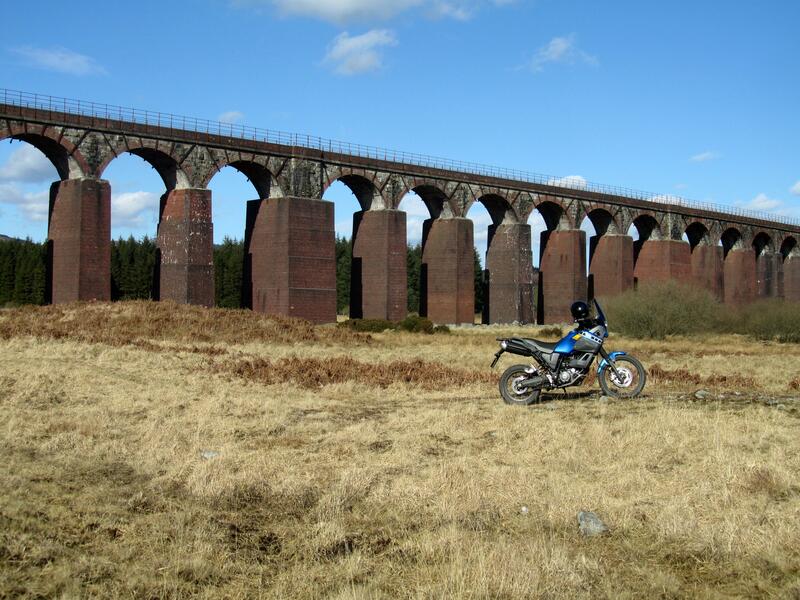 ‘The Viaduct’ is the first of those I saved. Let’s see whar else I can dig up. 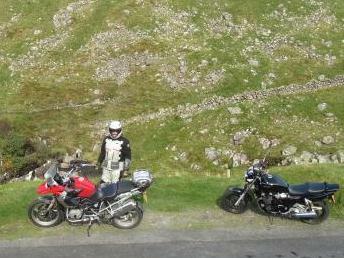 With rain promised from this evening till Monday I didn’t need much persuading to go for a ride when Phil phoned. He has had self-confessed lazyitus where bikes are concerned since he came back from his ‘long-weekend’ thrash to Austria and it was good to feel the road beneath our wheels again. 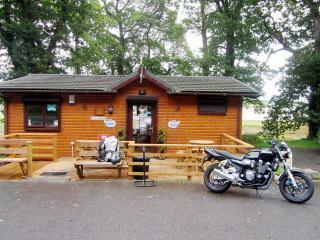 St Mary’s Loch tearoom was our target but we took the ‘long way round’ by Lockerbie and Eskdalemuir. A good choice despite the fact the hill road was officially closed after passing the Yeti’s Temple. After the Yeti’s Temple it got a bit muddy but no problem really and we just chilled out and enjoyed the ride through the beautiful Border hills. When we came to the road closed section the JCB operator moved his machine off to the side and we were waved through. 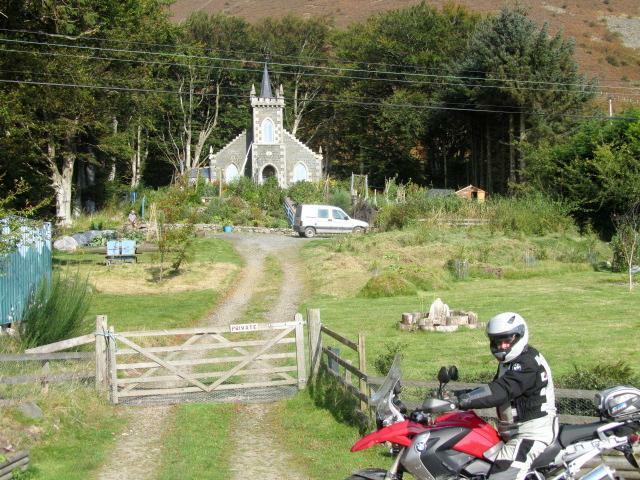 The little church in Capercleuch by St Mary’s Loch caught my eye sitting there in full sun so the camera came out again. Turns out it is now a house and the owner came down for a natter over the gate. To my surprise we knew him! He was the previous operator of St Mary’s Loch tearoom which was our next port of call. When my pie and chips were served I was wishing he was still the proprietor. It was poor tucker! With me muttering into my helmet about the nosh we backtracked to Capercleuch and swung left on to the Meggat Dam single-track road. After a photo sesh at the top of Broad Law we followed it all the way through to Tweedsmuir. Maybe there’s time for one more. What a difference a bit of sunshine makes! 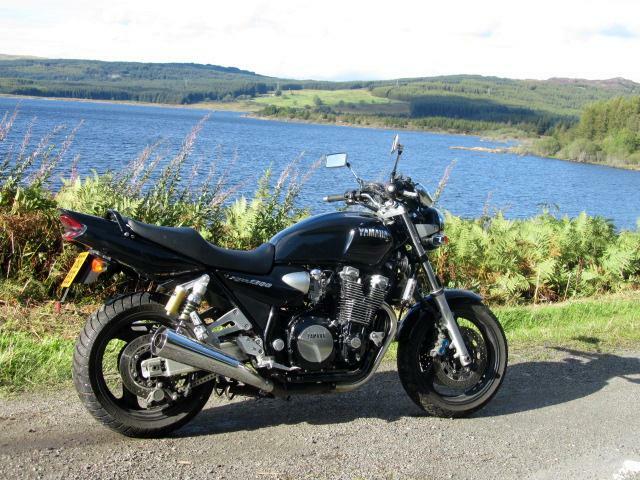 Or even moonlight because that’s what I had this morning when I set off for a long day in the saddle of my XJR 1300. 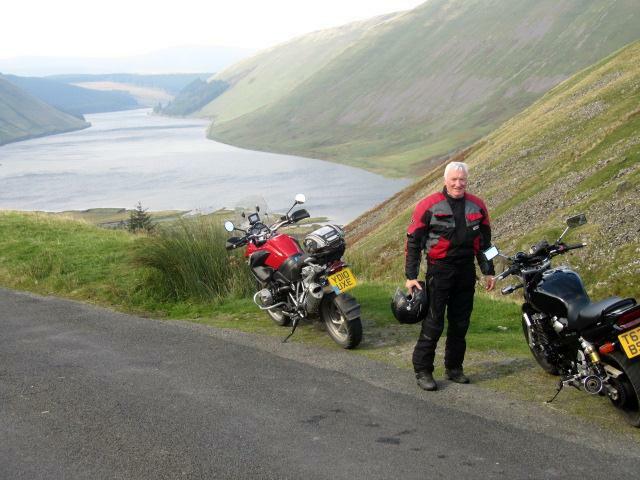 I was heading north to tie up with a loose band of fellow bikers who are the remnants of a bunch who have been meeting on the shores of Loch Earn in Perthshire since the early fifties. An added attraction for me was that my daughter was on a flying visit to central Scotland for seventy two hours and I hoped to lay claim to some of her precious minutes. My old XJR was shinier than a shiny thing when I wheeled her out this Sunday morning after a day spent washing and polishing. I was tempted to leave her under wraps and take the car – for all of two seconds.By the time I was on the A75 heading east the sun was above the horizon and shining full in my eyes. The early morning mists were lifting out of the hollows and I wanted to stop for pics but with the best part of four hundred miles for the day in front of me I kept on riding. With one hour down I was through Moffat and heading up the twisting climb towards Edinburgh on the A701 past the Devil’s Beeftub. Not that I saw any of it in low cloud cover. I could barely see the grass verge but as I cleared the summit visibility improved. It was broad daylight up there in the sunshine with the moon still high. I did notice the wind turbines on every skyline. It was just above freezing and not one of the expensive monstrosities were spinning! The guys who make the rules should get out more and see for themselves just how useless the bloody things are! Two hours down – I was past Edinburgh and warming my pinky’s round a mug of coffee in Mac’s by the Forth Bridge. It had been pretty cold on the way up so I found a job for the Sunday Times that someone had left behind. I stuck it up my jumper! No more problems from the cold windblast on my chest for the next stage by Knockhill Race circuit where I had competed in years gone by. As usual it was cold and driech on that windswept hilltop and I wasn’t tempted to linger. Knockhill had been my favourite circuit but no peg-scraping antics today on the cold and greasy roads. In fact I was pointing a single digit at a farmer on his tractor at one stage after winging over the brow of a hill and skating sideways on the mud he had dragged from the roadside fields. He was obviously trying to get the baled silage in before the snow forecast for Monday arrived. Up by Rumbling Bridge and through Glen Devon was an old favourite and posh Gleneagles Hotel was basking in sunlight as I tiptoed past the big team of excited young cyclists photographing one another by the entrance. 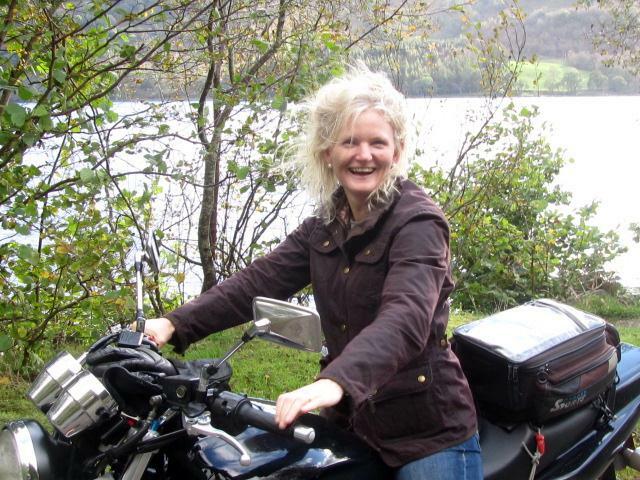 Soon I was through Crieff – home of actor and Round the World rider Ewen McGregor and heading west for Loch Earn where I found a few bikes in the lay-by before me.It was just like old times except that today we didn’t have a fire. No worries – brilliant sunshine was enough and I had carried a couple of flasks of hot water north so tea was soon on the go. My day was complete when daughter arrived in her hired VW Golf with more tea and filled rolls. It was just like days of yore when she would meet me for a natter with the biker boys on that same spot. As usual the craic was good amongst the lads with many subjects touched on and humour to the fore. We are a diverse bunch of bros with life-times spent in biking being the common denominator. Old friends are remembered with laughter and fondness Many have inevitably passed on as this informal meeting place of like-minded souls has been going for over fifty years. In the past I have been living down south or overseas for long periods but have still felt as if I had never been away on my return.The faces may change but the welcome remains. All too soon it was three o’clock and time to head for home. Not for me the more direct motorway routes which would have taken an hour off my journey. Doncha know the lack of corners wears flats on the centre of the tyre and ruins it for fun times on the twisties. Not good for an ol’ corner-hound like me!